It is not difficult to see that information expressed with one set of symbols can be translated into information expressed with another set by some suitable conventions, e.g. to convert a sequence of decimal digits into sequences of 0’s and 1’s we could replace 0 by 0000, 1 by 1000, 2 by 0100, 3 by 1100, 4 by 0010, 5 by 1010, 6 by 0110, 7 by 1110, 8 by 0001, and 9 by 1001. Alternatively one could assume that the sequence of decimal digits represented an integer according to the ordinary Arabic convention. This same integer could also be represented in the scale of two and would then appear as a sequence of 0’s and 1’s. There is an infinity of alternative possible conventions. However we are not obliged to choose any one of them. The possibility of this translation process was only mentioned to show that there need be no loss of generality involved in using only two symbols. Although we shall not need these translation conventions we shall often wish to interpret a sequence of 0’s and 1’s as meaning some integer. The most natural convention to choose is that by which the value of a 1 in the rth position from the right hand is 2r?1, so that 25 is represented by 10011 instead of 11001. These facts may be described by saying that the machine uses ‘the scale of two with the most significant digits at the right hand end’. 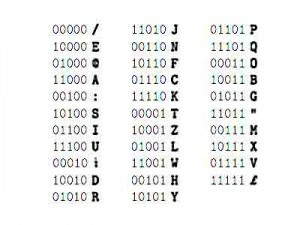 These symbols are essentially the teleprinter code, except that the combinations 00000, 01000, 00010, 11011, 11111, which in true teleprint are represented by no effect, line feed, space, carriage return, figure shift, letter shift respectively have here been given the representations /, @, :, 1 , “, £. These symbols have been chosen so as to enable the upper case of a typewriter to be used throughout. In manuscript or with other typewriters we permit the synonyms % for /, 1	for 1 , $ for £. With certain kinds of teleprint apparatus it may also be necessary to permit the synonyms 2 for @, 4 for :, 8 for 1 , 5 for “, 0 for £. These six combinations will be known as ‘stunts’. The user is strongly recommended to learn the above table. [Turing had no problem remembering things like this, so why should anyone else? Note that the characters do NOT fall in alphabetic sort order.] A number of aids to computation in the scale of 32 are given on Figs. A, B, C & D. These include addition and multiplication tables, special tables to assist in multiplication by powers of two, powers of 10 in the scale of 32, and aids to decimal-teleprint conversion. In principle it is possible to do without these aids for the machine itself can do all the conversion processes required. In practice it frequently happens that some single number is required in the scale of 32, and it is found less trouble to do the conversion by hand than to use the machine. To convert a decimal number less than 1 to scale of 32 multiply by 1024 subtracting and recording the integral part at each stage. This can be done very quickly with a Brunsviga [mechanical calculator] with transfer. The integral parts obtained may be broken up into two teleprint characters with the aid of the table on Fig. B. Posted by David Stutz on Thursday, April 19, 2012, at 2:45 pm with permalink.